The 24.71 metre motor yacht Alter Ego, listed for sale by Tom Jenkins at Allied Marine, has been sold with Moran Yacht & Ship introducing the buyer. Delivered in 2012, Alter Ego was built in GRP by Italian yard Ferretti with design inside and out by Zuccon International Project. Accommodation is for eight guests, split between a full beam master suite, two doubles and a twin, all located on the lower deck and equipped with entertainment centres and en suite bathroom facilities. There are also quarters for a crew of three. Interiors throughout are fresh and modern with light woods and pale upholstery creating a feeling of space and airiness. In the main deck saloon this atmosphere is aided by large windows allowing for plenty of natural light. The bulk of this area is dedicated to comfortable seating on two large sofas, one of which faces a 42” Samsung television with Bose surround sound, while a dining table for eight is located forward. Further forward still is the galley, which offers dinette seating around a table for casual snacks, and the lower helm station. Moving outside, the main deck after feature sunpads, which can be converted into an al fresco dining space with the addition of a table and four chairs, while the foredeck offers further sunpads and built-in seating around a coffee table. Up on the flybridge a retractable hardtop provides shade for a dining table with U-shaped banquette seating with a fridge and grill also found in the area. Further sunpads can be founds aft while this space is also used for storing a 3.6 metre RIB. 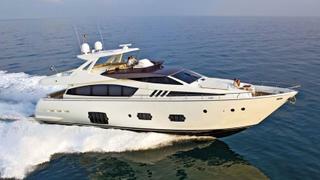 Power comes from twin 12V 2000 MTU engines to give a top speed of 31 knots and a comfortable cruising speed of 27 knots. Alter Ego was asking $2,795,000.